This is the third edition of the Set Theory and General Topology Week (STW), after two editions held at the Universidade Federal da Bahia in Salvador, Brazil. 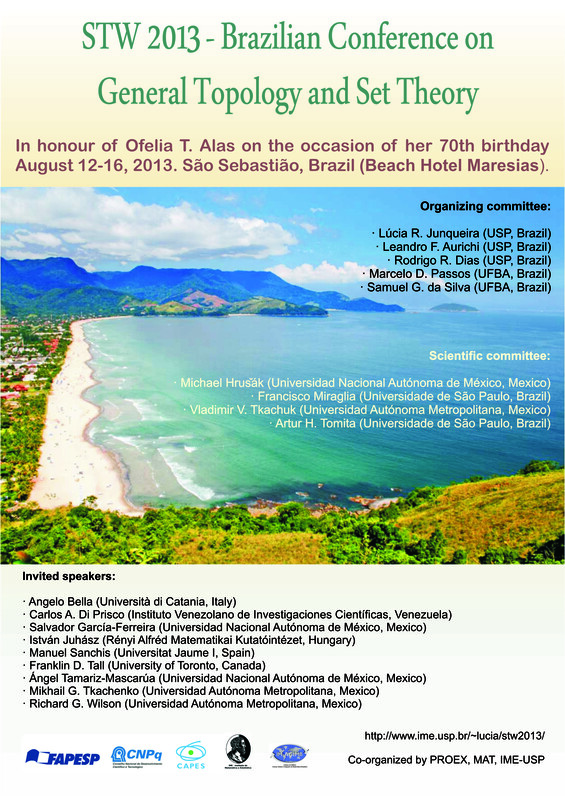 This special edition is dedicated to Ofelia T. Alas (Universidade de São Paulo) on the occasion of her 70th birthday, and will take place in São Sebastião, Brazil — see Location for details. The aim of this conference is to bring together students and researchers from around the world in the fields of General Topology, Set Theory and their applications. The conference will consist of 9 plenary talks, contributed talks of 25 minutes and poster sessions. The official language of the conference is English. A special issue of Topology and its Applications will be dedicated to the proceedings of this conference. Please see Proceedings for details.